Basic positioning data such as own ship position data, its data integrity, time, etc., are presented. Also, display mode as well as notice icons are displayed. 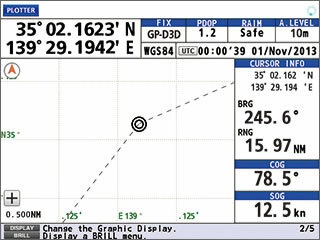 The area shows the information specific to the display mode currently selected. Please refer to each of the display modes for details. Guide to currently available actions is displayed. Under alert situation, the information about the most imminent alert is displayed. 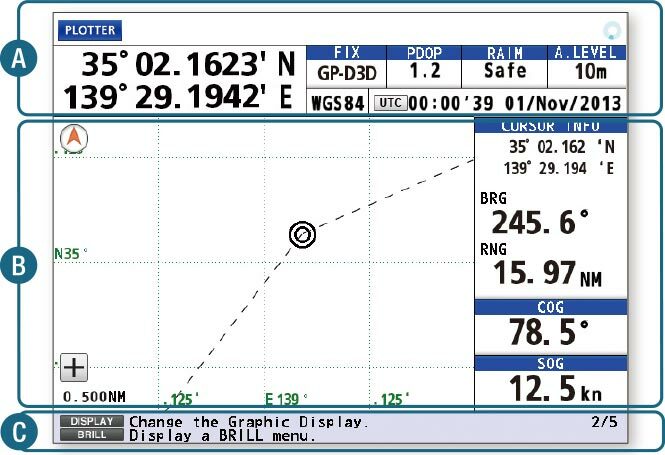 Status on GNSS/SBAS satellite signal reception; incl. * when autopilot is interfaced, the following information is shown in the data boxes: Autopilot status data box, incl. 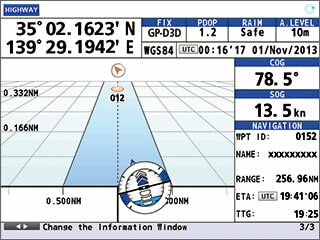 mode, ship�s heading, rudder angle, and COG, and SOG data box. 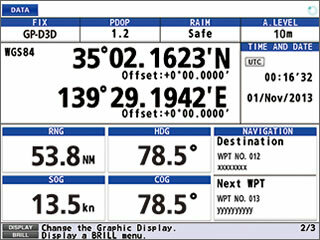 **Selectable when DGPS beacon receiver is incorporated into the Display Unit GP-170. *Specify when ordering. The GPA-019S from the GP-150 previously installed can be used. If type-approved DGPS is required, please replace it with GPA-021S.